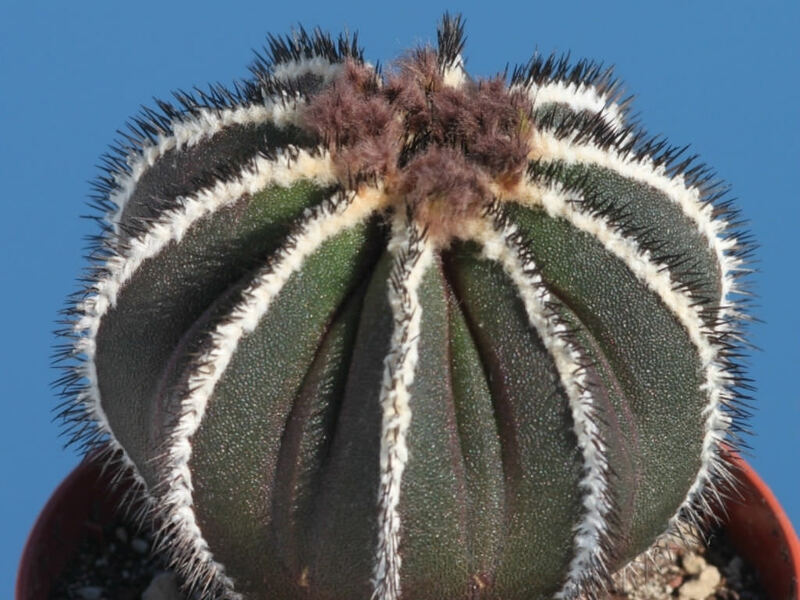 Uebelmannia pectinifera is a solitary cactus up to 3.3 feet (1 m) tall. The stem is with 13 to 40 ribs, up to 7 inches (17.5 cm) wide, reddish-brown or green to grey-green, with or without white scales. 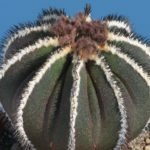 The plants grown in shadow are green with white stripes, while the ones in full sun take on a dark frost brown or purple color. The areoles forms an almost continuous felt-like line down the ribs’ sides, with sparse, grayish or brownish wool when young. 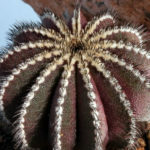 The spines are brown-grey to black, but also whitish or yellowish brown and up to 0.8 inch (2 cm) long. 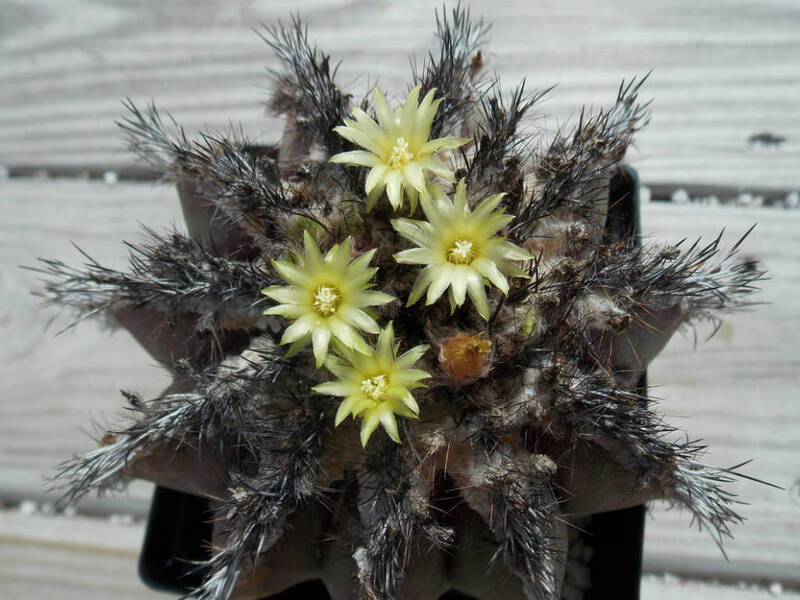 The flowers are diurnal, funnel-shaped, greenish yellow, up to 0.5 inch (1.2 cm) in diameter and up to 0.6 inch (1.5 cm) long. The flowers appear sporadically from early spring to late summer. 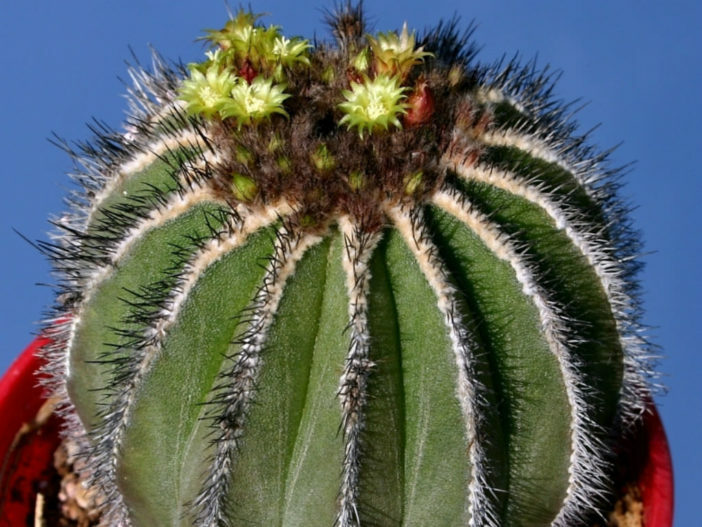 Even for cacti, these plants have a low tolerance for cold temperatures and letting them into even temperate conditions is an easy way to damage them. Make sure to keep well watered, as well, and give them lots of light. Their roots need some space and really good drainage and keep an eye out for common pests that can damage them. 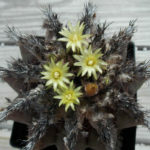 Uebelmannias, however, are such rare and difficult plants that only those with lots of practice growing cacti will likely even have access to them. These will likely only be found in specialty shops and their cultivation should be left to the experts. 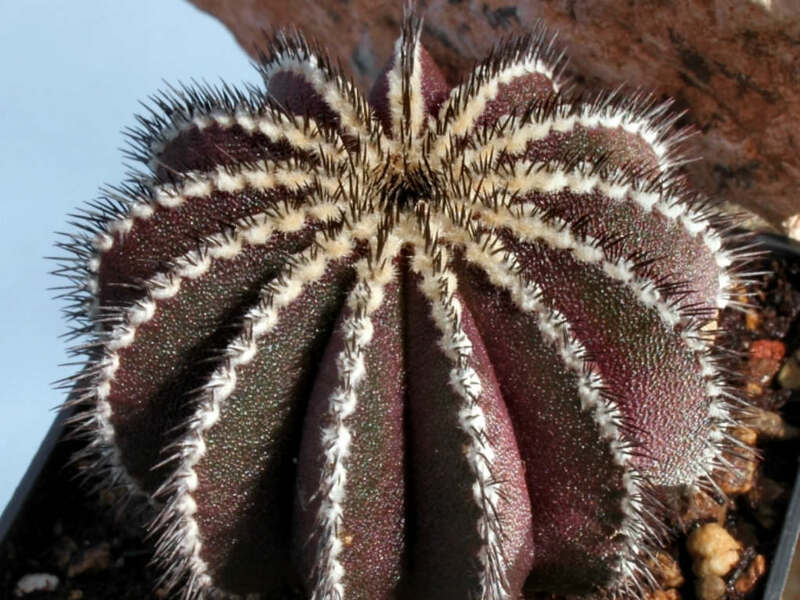 If you do cultivate one, though, they are among the most singular-looking of all cacti. Uebelmannia pectinifera is native to Brazil. Its natural habitats are dry savanna and rocky areas.